Having first rode a trial at Low North Camp some 38 years ago as a schoolboy; Wayne Braybrook has a close connection with not only the venue, but also Scarborough and District Motor Club who own the site. Months in planning, Round 7 of the high profile Rock Oil Championship was possibly the best event of the season so far, a fantastic line up of riders, stunning weather, a great venue, and crucially Wayne Braybrook who knows how to create the perfect course to test all riders from Novice to Expert. First up Sunday Morning no less than 26 Youth riders took to the line. A shorter Youth friendly lap was laid on which saw Brooke Mudie steal the Auto win by around 40 seconds from Jack Houghton. RAW rider Bert Boam grabbed the Youth B class whilst Cory Cookland smashed the Youth A win after a great battle with William Cawte from the Isle of Man. The packed start area for the AM adult race saw Sportsman Elite riders first away, Jack Winn was on a mission taking P1 with James Cooke Thomas placing runner up taking 1st place points home to Sheffield. Mick Alderson grabbed top spot points in the Sportsman Vets class finishing one lap up on Gary Nicholson who thrashed his 125 Beta around the camp. Stephen Boyle had a great day to take third in class. 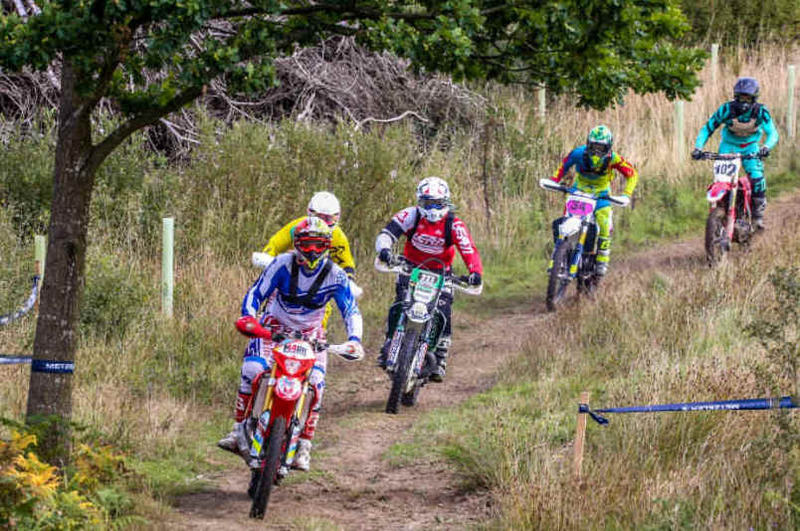 The course around the camp had the old MX track in use, with just the right mixture of woodland and tricky gullies to test the technical ability of riders. 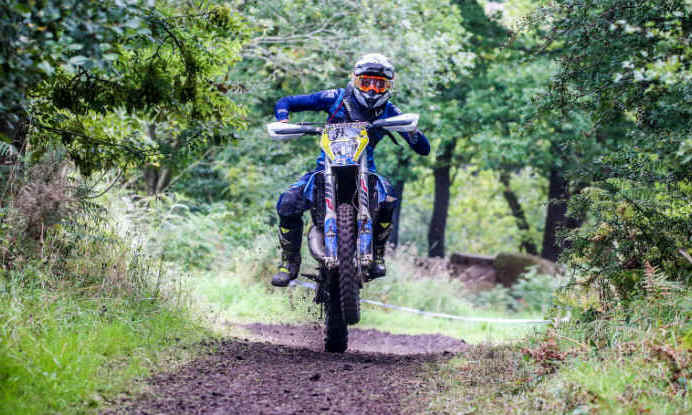 Kev Hipwell is a good trials rider, his old MX days soon came back as he won the Over50 class from Andrew Maben is runner up place. Abbie Piggott took the Ladies win in a close race with Simone Wallis and Sarah Thomas. Wallis lucky to finish runner up after her chain guide broke off forcing her to stop to fix a de railed chain out on track. A fantastic turn out of 14 Expert riders graced Low North Camp. Made up of some world-class trials riders the scene was set for some fierce battles. Two extra sections were added to test the afternoon riders, both up tricky single file gullies. For the first 40 minutes all the expert riders were close until CJT Beta rider Jono Richardson hit the front on his Beta. 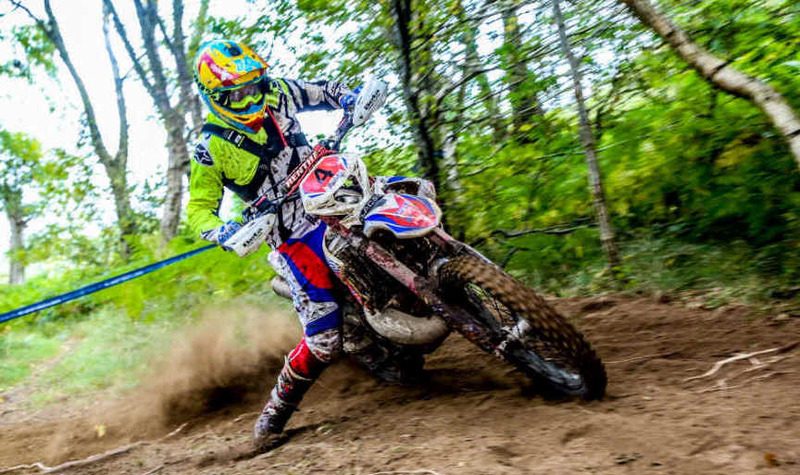 Chased down by Sherco rider Lee Sampson the pair swapped paint for a few laps until Sampson decided to settle for runner up to save his bike ready for shipping to Sea to Sky in Turkey the following day. Richardson ran out a clear winner finishing with a decidedly wrecked rear tyre!! Lewis Ellis raced hard for the full 2.5 hours to take a well deserved third, he had Gas Gas UK’s Michael Brown for company in the closing stages, Browns technical ability kept him in touch whilst Ellis’s MX skills would have always kept him at bay after brown ditched his goggles. Clubman honours went to RAW rider Joe Townsend taking his first win of the season. Liam Crowe had a great battle with Townsend, and for a good part of the race Crowe set the pace, when Crowe fuelled Towny checked out to take the win. Neil Marshal placed third and was over the moon after a tough old race on his TFR KTM. Battle of the day went to the Elite Vets; Anthony Crowe on his D3 KTM set the pace for a large part of the race. Martin Sandiford out on his new 2019 Gas Gas was always close to Crowe, after a swift pit Stop Sandiford went back to his MX roots to catch up and pass Crowey with one lap to go! Respect to both old boys for putting on a good race in the gentleman’s class. To sum up, this event at Low North Camp was the best one ever at this venue, yes the weather played its part, it has to be said that RAW Enduro showed everyone how a top class event should be run at a premier venue such as Low North Camp. Thanks to SDMC for the collaboration with RAW and the Rock Oil Championship. Until Next year Low North Camp is now back to the steady pace of trials.